A Paradigm Shift is when a significant change happens – usually from one fundamental view to a different view. In most cases, some type of major discontinuity occurs as well. In laymen terms, Paradigm Shift is a popular, or perhaps, not so popular shift or transformation of the way we ‘Humans’ perceive events, people, environment, and life altogether. It can be a national or international shift, and could have dramatic effects — whether positive or negative — on the way we live our lives today and in the future. Paradigm shift is a basic theory. It is a conceptual framework within which scientific theories are constructed. It is notion of a major change in a certain existing pattern. It is a radical change in personal beliefs, complex systems and organizations replacing the former way of thinking with a radically different way of thinking. During paradigm shift one conceptual view point of the world changes to another conceptual view point. It is a revolution, a transformation and a sort of metamorphosis. A paradigm shift is visible when a significant change had happened usually from one fundamental view to another fundamental thinking. In simple language paradigm shift is a significant popular or unpopular change, shift or transformation of the way human being perceive life, environment, events, working methods and implements from an earlier way to a new way. The shift has dramatic effect whether positive or negative on the way the life as it is lived today. In this shift, today’s dominant viewpoint is changed to another viewpoint. Paradigm shifts normally bring irreversible changes. The transformation in paradigm shift can be gradual or sudden but ultimately it changes the way of thinking or way of doing things. Thomas Kuhn fathered, defined and popularized the concept of paradigm shift. He wrote about Paradigm Shift during the early 1960s, and explained how “series of peaceful interludes punctuated by intellectually violent revolutions” caused “one conceptual world view to be replaced by another view.” He wrote a book in 1962 on the structure of scientific revolution. In his book he described it as a change in basic assumptions within the ruling theory of sciences. As per him the successive transition from one paradigm to another paradigm is the usual development pattern of mature science. He gave scientific paradigm its contemporary meaning when he adopted it to refer to the set of practices that define a scientific discipline during a time period. Thomas Kuhn explained that a scientific revolution occurs when scientists encounter anomalies which cannot be explained by the universally accepted paradigm within which scientific progress had been made hitherto. When enough significant anomalies have accrued against a current paradigm, the scientific discipline is then thrown into a state of crisis. During this crisis period new ideas, perhaps ones previously discarded are tried. Eventually a new paradigm is formed which gains the acceptance all around. This shift of scientific discipline from one paradigm to another is known as paradigm shift. During paradigm shift series of peaceful interludes punctuated by intellectual violent revolutions happens. It just does not happen on its own but rather it is helped and driven by the agents of change. A techno economic paradigm shift is the embodiment of this new potential in a new set of “best practice” principles that accompanies the diffusion of each technological revolution. The new paradigm is capable of transforming every branch of the industry and the economy, renovating products and processes, relocating activities, redefining markets, redesigning firms and gradually modifying the ways of producing and the ways of living. Paradigm shifts result in new businesses that transform or destroy old ones. 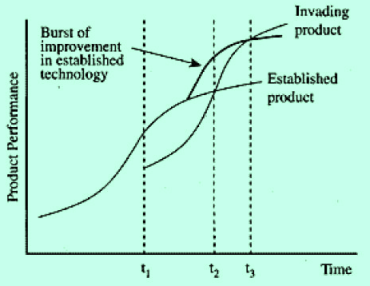 According to Utterback (Fig 1), when an invading technology first appears (t1), the established technology generally offers better performance or cost than the challenger, which is still unperfected. Eventually, as the performance characteristics of the challenger reaches the point where it matches that of established technology (t2), incumbent leaders perceive the threat and invest heavily to sustain their business models and leadership. Their resulting innovations cause them to rocket past the invader with rapid innovations and improvements. Eventually, by time t3, the challenging technology continues to improve and equals existing industry performance, on this path to ultimate leadership. Even though a new paradigm may not have open competition, competitive priorities are still relevant for strategies to cross the gap between paradigms. In fact, competitive strategies exist across technological paradigms, since existing strategies are being threatened by the new technological paradigms. Each paradigm has its own life cycle of development, with a continuing sequence of competitive priorities leading to continuous improvements. The performance of existing competitors impacts on the ability of firms with new paradigms from bridging the competitive market gap, i.e., developing a strategy and capabilities for the paradigm that outperforms existing paradigms. Hence, in the context of paradigm shifts, it is important to understand that competitive priorities are critical in bridging the gap. To cross the gap, a paradigm’s success strongly depends on its existing capabilities and competitive performance. This means that quality and cost metrics must first provide the new paradigm with a significant advantage over incumbent paradigms. This is akin to advancing the price/performance frontier. Accordingly, the need to focus on basic competitive performance suggests that quality, dependability, and cost may be critical in bridging the gap. Flexibility appears to be a priority for maturing markets with more standardized technologies, such as Dell applies to computers. Such flexibility is seldom a competitive factor in new business. Quality remains the most important priority and reliability remain entry level priorities. Cost then sets the new paradigm on a growth path. We hypothesize that competitive priorities between paradigms must be addressed in the same fashion as competitive priorities within established paradigms. Initially, the success of a new product-market strategy will depend on its competitive value, based on its quality and reliability characteristics first, and then its cost. Once a new paradigm becomes accepted, its competitive success hinges on a steady stream of innovation that sequentially and cumulatively improves competitive quality, dependability, cost and flexibility. There are many examples of paradigm shift in every sphere of life. Adoption of settled life with agriculture by man in place of wandering life is one of the earlier examples of paradigm shift. During sixties invention of quartz watches replaced the mechanically driven watches. This has thrown out of gear the highly successful Swiss watch industry which was based on mechanical watches. This shift was a paradigm shift. Now another paradigm shift is taking place which is making even the wrist watches irrelevant. In cricket switch over from test cricket to 50-50 version and now to 20-20 version is a paradigm shift. Further examples of paradigm shifts are replacement of postal mails by e mails, replacement of landline phones with mobile phones and so on. There are a large numbers of examples of paradigm shifts in the iron and steel industry. Some of major amongst them are given below. Replacement of wrought iron with steel. Processes relating to reduction in the process steps such as thin slab casting and rolling. These technological developments have led to a paradigm shift in the way steel is made, the price, quality and range of products generated, energy requirements, material usage and the byproducts generated. The paradigm shift has brought and bringing a considerable change in the basic structure of steel industry. During the shifting of the paradigms, the earlier paradigms become irrelevant. They loose their identity and soon disappear from the scene. The organizations which judge this shift in time and change over to the new paradigm earlier than others become successful organizations and succeed in the competitive field. Ihave never found such a wonderful explanation for the management word paradigm shift.The no. of examples drawn from steel industry are really convincing.great contribution from Mr Sarna indeed.